There is a new James Bond mobile game out, called James Bond: World Of Espionage! Haven’t heard of it? Probably because it hasn’t been advertised at all. Probably because it is the most pointless, uninspired, redundant trash heap of coding to ever associate itself to a successful property in the history of the app store. The James Bond films are a big deal. Like, 24 movies and counting, over the past 53 years, and close to $10 Billion in revenue type of big deal. When a new one comes along, it is a global event; a celebration of the World’s greatest super-spy ever committed to film. Wise to their game, the owners of the James Bond property, Eon Productions (who have been the owners since the first day, 54 years ago) always try to capitalize on new films in their franchise with merchandise, documentaries, premieres, box-set releases, new official James Bond novels (like this year’s Trigger Mortis), and ever since 1983, new video games! Daniel Craig’s era as the James Bond actor has seen this tradition continue, with Activision (the Call of Duty people) producing a tie-in video game for 2008’s Quantum of Solace, 2010’s solo title 007: Blood Stone, and 2012’s 007 Legends to celebrate the 50th anniversary of the franchise. 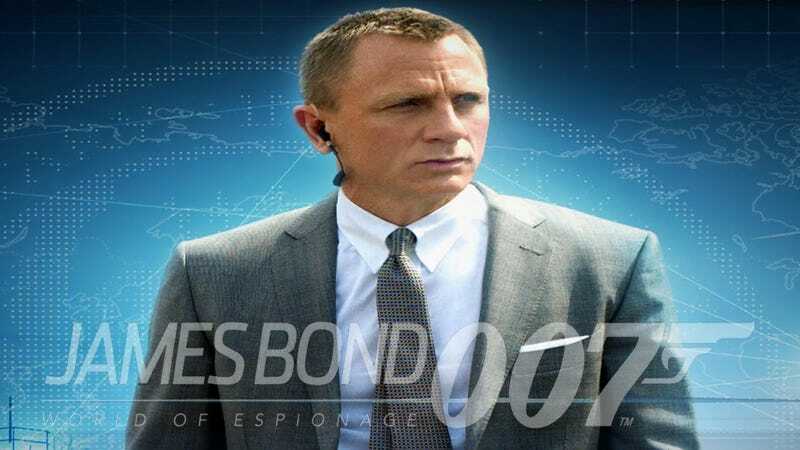 Daniel Craig’s tenure has also seen a number of mobile games, including a great side-scrolling game for 2006’s Casino Royale, two downloadable games for 2008’s Quantum of Solace: a side-scrolling sequel to Casino Royale, and an arcade game called Top Agent. The two side-scrolling games were developed by mobile gaming company Glu Mobile, Inc. This is also the company that famously brought you the $43 Million dollar grossing (and counting) Kim Kardashian: Hollywood gaming extravaganza. 2012’s Skyfall did not have a mobile game released to coincide with the film, but for this year’s upcoming Bond film SPECTRE, Glu Mobile is back with a new mobile gaming adventure. Well, they’re definitely back with.. something; maybe actually nothing. Exclusively announced by MI6 (the James Bond fan site, not the British Secret Intelligence Service) last month, James Bond: World of Espionage promised to be an exciting mobile-gaming globe-trotting adventure, the development of which helped to substantially boost the share price of the gaming company. The game launched last week, July 18th, with almost no notice and absolutely no advertising. I even struggled to source an official-looking title image for this post. This seems peculiar, but some may reason that they are releasing it early to gauge feedback and to work out any post-release bugs before the rush that comes once the game is promoted. I don’t think that is the case. If you take a good look at just what Glu Mobile has produced with James Bond: World of Espionage, it seems more likely there is nothing to promote. It appears you tap the screen and the app does the rest, even pointing towards what you need to tap next. There’s no user control over.. anything. It is pretty much a boring, motionless spy story distilled down to it’s simplest point, presented to you as a flip book that you only have to tap along to. Yes it does have a few “dynamics” that allow you to “choose” your next mission, as well as collect Energy, Stamina, Offense, Defense, and Health Points. None of these really matter though, as you start out with so much energy, and burn such a little amount to accomplish missions, it might as well be infinite. It appears there is virtually no need to build Stamina, which is used to unlock other methods of finishing your opponents off. In the video above the user simply uses the default option and is successful. The Offenses and Defenses are simply a point value, and don’t actually allow you to curate or customize any sort of multiplayer role. You tap to earn values which are pointless to spend, with an option to battle in “multiplayer” which simply rewards you with more redundant points. You also can choose from a list of imaginary characters that have little or absolutely no connection to the Bond franchise, and there are different multiplayer roles which let you go one-on-one, or build an “agency” and try to rank higher than other “agencies.” Sounds.. completely pointless to me. Tap here, have some points, see where you stand. There is no apparent goal to the game than to simply complete it, with no reward outside of a numerical value, and no fun or spirit, unless you really love following a red target around and tapping with your finger. Is it too much to ask for a racing level; tilt the phone, and the Aston Martin DB5 avoids rockets as you speed towards some blushing beauty held captive on a mountain side? A tap-to-shoot style game where you move through an MI6 headquarters under siege and have to save M., Moneypenny, and Q from the evil S.P.E.C.T.R.E. agents (which Eon Productions just dished out major cash to purchase all property associated with the famed James Bond baddie organization)? Where is the creativity? A James Bond game should be sleuthing for information unlocks as you sneak by guards, a shoot-your-way-out type of mission, some drive-by-finger crazy chase levels, maybe a helicopter sequence to mix things up - a James Bond game sure as hell shouldn’t be simple. Simple is boring. James Bond: World of Espionage isn’t even simple, it’s barbaric in terms of the potential of a 007 mobile game. That Kardashian game looks a little more inviting now..
Give me a GoldenEye 64 port for my phone and we’ll be in business. For an even more in-depth look at what the “game” has to offer, go over to MI6HQ who has all the breaking coverage of this new “exciting” James Bond mobile gaming app. If you want to check it out, it’s available in both the Google Play store and the iTunes App store.